Remember when girls discovered fly hackle and drove up the cost of tying flies because they wanted rooster feather accessories in their hair? Well, a fly-fisherman has journeyed to their world and discovered craft beads. A few years ago, I began to hear whispers about a new way of catching steelhead. A tiny number of guides and fishing writers had begun to experiment with drift-fishing acrylic or glass beads. Word filtered out on on-line forums and the circle of anglers “in the know” grew bigger. In truth, beads have been used in steelhead fishing for a hundred years; think Corkies, Okie Drifters, beadhead nymphs and spinners. Beads are used to target sockeyes in Alaska and the rainbows and Dolly Varden that feed behind spawning salmon. Yet in many ways, bead rigs are new on the steelhead scene. I was interested in beads for steelhead, but I didn’t feel I needed to get deep into a new system, when I have a garage full of tackle already. Then I met Loren Dunbar, one of the founders of the Hevi Bead system. Dunbar moved to Eastern Washington from Colorado 18 years ago and started fishing for steelhead. He came not from a tackle background, but from furniture sales and a passion for fly-fishing. On the Methow River, on the second day of using beads, Dunbar and a friend caught and released 11 steelhead. On a three-day trip the two anglers landed 21. At first he used weighted flies to get the plastic beads in the zone, then he started to use heavier craft store beads with unweighted flies. The fish were eating the beads. Fish grab beads for the same reason they bite a salmon eggs or egg flies. Arguments have simmered about the topic for years, but the point is fish are programmed to eat other fish eggs. And eggs tumble along the bottom. Bead fishermen hav e used a lot of different ways to get beads down. A common way is to employ a drift-fishing technique with pencil lead or split shot bounced along the bottom. Beads are knotted or toothpicked to the line. But steelhead don’t take beads with a lot of force; bites are hard to discern. With lead, the fish grabs the bead and has to move the weight before the angler feels or sees the bite. Dunbar took that thinking, threw it out and started over. With a heavy bead drifted beneath a strike indicator like a Thingamabobber, or a small float, the reaction is immediate. When they realized they were on to a system, a new way of thinking about beads, Dunbar and friends, Mark Stevenson and Reed Swallow, founded Hevi Beads (www.hevibeads.com). At the heart of their system is a bead made of glass and ceramic, heavier than wood or acrylic. They come in various sizes and in countless finishes. To fix it to the line, the bead is fit with a band threaded through the bead. Bands come in steelhead colors like pink and orange. With this system, there is no reason to use knots and loops that weaken line strength or jam toothpicks into the beads to keep them in place. The Hevi Band cushions the line and holds the bead on the line with a friction fit. For steelhead, Dunbar likes to place the bead about two fingers' width from the hook. At the hookset, the line slides through the bead and the hook plants. Another innovation is the Bead-It Tool, a pen-sized implement used to pull bands, leader, feathers, Krystal Flash and rubber legs through the beads. With the Bead-It Tool and the Hevi Vise, with its 2x and 6x magnifiers, an imaginative tackle crafter can build egg imitations, leeches, flesh flies and stoneflies as well as spinners using traditional blades and clevises or Mack’s Lure Smile Blades. With the beads on the band and the band pulled tight between the alligator clips, the beads slide and give enough room to run leaders, marabou and flashing. Lay the feather down on the band and push it through the beads, pull some feather out with the tool. Then release the tension, the band gathers the material and cinches it together on the leader. Rigs can be tied at home or streamside. A piece of foam is a great way to store the pre-tied rigs and leaders. 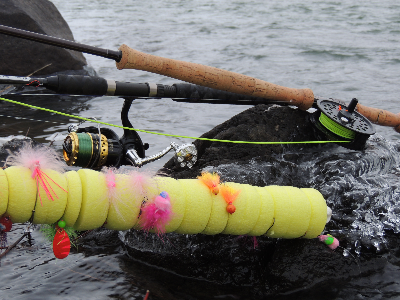 I like the versatility; the system is adaptable to spinning gear, bait casters and fly-fishing. Go ahead, go to their world, stop in at the craft store, make your own jewelry. Winter steelhead will be bedazzled; just don’t wear it in your hair.